A Northwest Side alderman is publicly opposing a zoning proposal in a neighboring ward, a move considered "unusual" since aldermen usually stay out of other aldermen’s wards and affairs. Alderman Anthony Napolitano (41st) said at a May 18 news conference at City Hall that he decided to run for alderman because he was "tired of elected officials not listening" to their constituents and that he is speaking out against a plan to build a mixed-income housing development at 5150 N. Northwest Highway in the 45th Ward because it is clear to him that the community wants the size of it scaled back, pointing to a stack of petitions with 5,500 signatures against the proposal. "Everything has an impact on surrounding wards," Napolitano said. He added that area schools are "bursting at the seams" and that the Far Northwest Side continues to have a police personnel shortage despite recent increases in the number of officers assigned to the 16th (Jefferson Park) Police District, 5151 N. Milwaukee Ave.
Council members usually follow the unwritten policy of "aldermanic prerogative," deferring local zoning matters to the alderman of that ward. Napolitano said that aldermen should not abuse that privilege by failing to listen to their constituents. Napolitano also said that he rejects accusations by project supporters that the opposition is being fueled by prejudice and racial bigotry. He said that "anybody" would have the right to live in the proposed building and that the community’s concerns center around height and density. Residents are hoping to preserve the bungalow and low-rise, multi-family character of the area, Napolitano said. "(The proposal) is getting away from the reason people move to the neighborhood," he said. 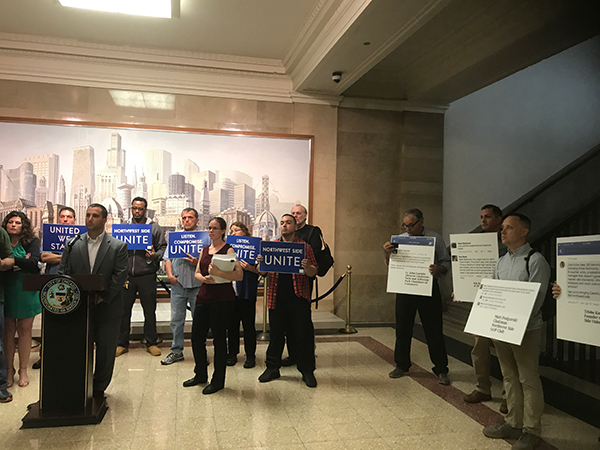 Napolitano made his comments at a news conference hosted at City Hall by Northwest Side Unite, which opposes the current proposal for the site, where a former food processing plant is located. Alderman John Arena (45th) had the site downzoned last year to stop a plan to retrofit the existing building into a self-storage facility. Arena supports a new plan which calls for a five-story warehouse and a seven-story, 100-unit apartment building on the 1.5-acre parcel. The current proposal resulted from a settlement agreement that city officials signed in response to a lawsuit that the site’s owner had filed objecting to the downzoning. Arena and zoning administrator Patricia Scudiero are required to support the site’s rezoning under the terms of the settlement agreement. Neighbors for Affordable Housing in Jefferson Park, which supports the project, held its own news conference after Northwest Unite completed its conference. The organization said that it was "sickened by the anti-black racism" and "overt bigotry" of project opponents, in a news release. The group has said that the proposal would help end the "shameful legacy" of segregation in Chicago. "In their view, property rights and property values reign supreme. In invoking their right to prohibit certain quantities (density and height) or qualities (neighborhood character) of people from their community, they double down on the very same exclusive traditions that built segregation during the middle of the last century. 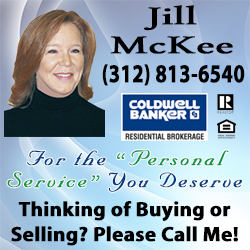 They’re not racists; their rigid view of the privileges of homeownership is." The group also read a list of derogatory terms such as "miscreants" and "scum" which they say project opponents have used to describe prospective tenants of the building, which would include 20 low-income units that would be subsidized by the Chicago Housing Authority. Arena has pledged to bring 50 new CHA units to the ward by the spring of 2019. Representatives of Northwest Side Unite have said that they do not object to plans for low-income and affordable housing at the site but are calling for the project to adhere to the four-story height recommendation in the Gladstone Park Master Plan. They have said that accusations of racism and segregation are being falsely made in an attempt to take attention away from the strong community opposition to the project and the lack of transparency. Arena signed the settlement agreement in January before the community was notified of the proposal and later said that while a February community meeting on the proposal was not required by law, he was holding the meeting as a courtesy. Hundreds of residents were not allowed entry because Branch Community Church filled up at least 30 minutes prior to the scheduled start time of the meeting. Project supporters have said that Arena was acting on behalf of the community when he signed the settlement agreement because he was fulfilling his campaign promise to bring more density to areas near the Jefferson Park CTA Terminal, 4917 N. Milwaukee Ave.
Another local group, the Jefferson Park Neighborhood Association, which opposes the project, has a longtime policy of opposing up-zoning in the area. After the news conferences, Arena issued the following statement: "I’m proud of the comprehensive community engagement process we’ve pursued around this proposal for much needed housing for veterans and people with disabilities. That includes the February 9 community meeting, meetings with community organizations, local school councils, faith leaders and individual residents, and the meeting earlier this week (May 15) to listen to the concerns of key community leaders on both sides of this issue. I’ll continue to seek guidance from my constituents and put their voices and interests above all else." The City Council Zoning Committee will hold a second hearing on the proposal at 2 p.m. Monday, May 22, in the Council Chamber at City Hall, 121 N. LaSalle St.